Welcome to our selection of holiday homes to rent in Sri Lanka. The Democratic Socialist Republic Of Sri Lanka is an island nation off the south tip of India in the Indian Ocean, formerly known as Ceylon until 1972. Its size is about 25,000 square miles. Its capital is Sri Jayawardenapura-Kotte. The population is around 20 million with about 70% followers of Buddhism. The two official languages are Sinhalese and Tamil but English is fairly widespread. The weather is unusual because there are two separate rainy seasons per year, one from October to January and the other from May to July. Typical temperatures for most regions is between 28 degrees C and 31 degrees C, but the north is significantly cooler than the dry zone. The land is predominantly flat with one mountainous region to the south. The country's main exports are tea, coffee, rubber, coconuts and cinnamon. It has a particularly long documented history of 3,500 years. During that time many different dynasties have been and gone and this provides a very great range of historic buildings and artifacts. 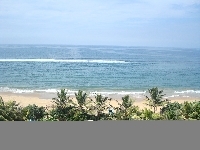 The levels of natural beauty in Sri Lanka have earned it the title of "Pearl Of The Indian Ocean". The coastline consists of unspoilt beaches with a very high standard of cleanliness. The inland is covered mainly with lush tropical forests. The range of exotic animals native to the island is very wide, including elephants, leopards, turtles, dolphins and flamingoes. These provide perfect scenery for activities such as bird watching, hiking, scuba diving and sailing. The Pinnewela Elephant Orphanage which holds the biggest herd in captivity anywhere, inviting visitors to view these creatures in happy and natural surroundings. The Royal Botanic Gardens at Peredeniya, Kandy. Within 60 hectares are contained fine examples of unusually large or unusually rare plant species. The many tea plantations all over the land, which give visitors a close view of tea production and the opportunity to sample many exotic flavours. Looking for self catering holiday accommodation in Sri Lanka? then below is a selection of villas in Sri Lanka and apartments in Sri Lanka that can be rented direct from their owners. You can either click on each listing for further details or you can use our search engine on the left if you are looking for something in particular.